Jimmy Wales' greatest work has been creating a free, online encyclopedia for everyone, and so it was a bit surprising to see Wikipedia founder launch a phone network earlier this summer. 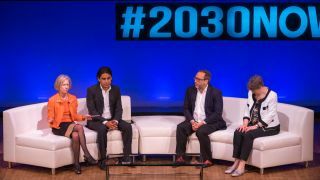 On stage at the Social Good Summit in New York, Jimmy Wales explained it was created in a hope to connect the world and help further important causes. Like other carriers, The People's Operator is an MVNO network that offers prepaid and post-paid cell phone plans and mobile internet contract. However, as an added wrinkle 10% of all customer's bill goes towards a charity of their choice. Wales explained that most carriers will take this 10% of their revenue to create flashy commercials and giant billboards, The People's Carrier's goals are to help more people around the world. "It's not going to change the world in any sort of fundamental way," Wales expounded. "But I'm hoping to raise billions of dollars for good causes." Furthermore, Wales highlighted how a $40 Android phone with the same capabilities of the first iPhone coming to market will have huge technological implications for developing worlds in the next few years. "The next one billion people are about to come online in the next five years and this is going to empower a huge number of people," he explained. Using the Arab Spring that occurred a few years ago as a key example, Wales said technology will be instrumental for the "rise of social activism from [groups] who previously didn't have a way to organize or research the facts."